The Oakville Hospital Foundation recently received a $250,000 donation from the Budd family that will help purchase equipment for the new hospital, scheduled to open in December. As a result of the donation, the Resuscitation and Acute Care Zone in the new Oakville hospital’s emergency department will be named in honour of the Budd family. Budds’ has been contributing to the Oakville Community Foundation for almost 20 years. The Community Foundation manages the money, and each year the interest made on the Budds’ family fund, goes towards local charities like the Kerr Street Ministry, Start to Finish, and many other small charities that help us enrich the lives of those less fortunate. To date we have over $ 300,000 in the fund. We have been running the Feast of the Fairways for 9 years and have raised over $250,000 for the Canadian Cancer Society. It is held at Glen Abbey each year, and features food stations on the course, by Oakville’s top restaurants, Jonathon’s, Mye Japanese, and Seasons as well as Glen Abbey and the Mermaid and the Oyster. Following the golf, Glen Abbey puts on a seven course gourmet meal with music and dancing for the golfers and their guests. A local business has partnered with the Canadian Cancer Society (CCS) in an effort to promote health literacy and provide support for those fighting cancer. Jaguar Land Rover Canada has donated $1.4 million to the CCS for use in this initiative as well as in support of the Inuit Cancer Project — a joint initiative by the CCS and Pauktuutit Inuit Women of Canada to improve health literacy among the Inuit and create a first-ever Inuktitut glossary of cancer-related terms. Jaguar Land Rover Canada is partnering with the CCS and Pauktuutit Inuit Women of Canada to build on the project, which involves developing cancer information resources for Inuit living with cancer and for healthcare providers to improve health literacy. 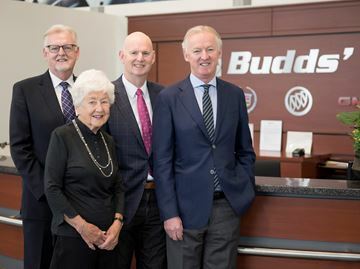 Budd’s Imported Cars will provide Oakville residents with an opportunity to learn more about Well Within Reach and how they can help Canadians affected by the debilitating consequences of cancer. For more information about the program, visit WellWithinReach.ca.